The late-night series on the most horrifying ephemera I can find continues today with a terrifying recipe from an undated General Foods staplebound recipe book titled "Joys of Jell-O." Now, I'll admit that Jell-O has its purposes. It's a fairly safe food when you're sick or just had your tonsils out. I have no problem eating it, in its plain form, as a standalone snack or dessert. 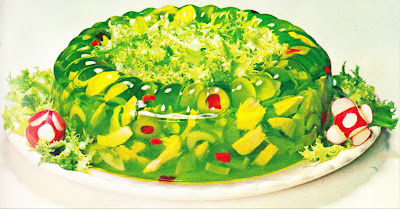 But let me be quite clear: YOU DO NOT PUT OTHER FOODS INTO THE JELL-O! And you SURE AS HELL do not put onions, cucumbers, celery, olives and flaked tuna into a mold of lime Jell-O. Yet that's precisely what the recipe for Ring-Around-The-Tuna - which is pictured with today's entry - calls for in "Joys in Jell-O." Other recipes in the book call for putting dried figs, carrots, cabbage, spinach, cauliflower, pepper, radishes, tomato sauce, chicken, beets, shrimp1, crab meat, potatoes and bleu cheese into Jell-O molds. 1. If it were up to me, putting perfectly good shrimp into a Jell-O mold would be a federal offense. I've really been enjoying the scary ephemera. This one is especially terrifying. And I agree with you about the shrimp! Don't eat the red jello. It will make you crazy. Actually for you use lime jello add sour cream and pimento it's refreshing and different. Actually if you use lime jello,sour cream, celery, green olives with pimento cut in half and tuna its good. Don't use a mold use a flat casserole dish so it can be plated with other salads or fruit.